"The will to win is not nearly so important as the will to prepare to win." Shadow boxing can be performed as a: training warm-up, technical development drill, sport application visual, and a overall training workout. Shadow boxing is an effective drill for a novice boxer as well as a competitive boxer. This is a drill can be used as a warm-up before training, conditioning training, technical training, or a sport application visual drill. Beginners should consider standing in place, or static, as they begin their experience with starting level shadow boxing. More developed and experienced boxers can utilize many other strategies and formats for their advanced shadow boxing. Shadow boxing training can be structured in three pace levels for non beginning boxers...50%, 75%, 100%. Beginner boxers should keep at a 50-75% pace. Each intermediate to advanced level boxer can start at a warm up pace of 50% followed by increasing the pace in additional rounds of 75%. Warm-ups and workout rounds should eventually accelerate to 100% of an individuals capable speed or pace. View LombardMMA instructional video for "Shadow Boxing Drills"
Remember that we all started somewhere, and helping the new, training with our equals, and learning from our mentors are all equally valuable. 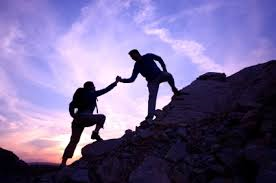 Helping the new learn will help you grow while you share knowledge so that others can eventually help push you to be better. Training with your equals will motivate all of you to grow together. And, training with your mentors and others that are more experienced and better than you will help mold you and keep you humble, which is the best ingredient for self-growth and reaching your potential. Train HARD, Train SAFE, Have FUN!! One way of gauging your exercise or workout intensity is to see how hard your heart is beating during or after the activity. The following are steps that can be taken to calculate this measurement so you can get the most out of workouts regarding proper intensity for your health and fitness goals. Step One: You first have to figure out your estimated maximum heart rate. The basic way is to subtract your age from 220. For example, if your age is 20, and you subtract this from 220, your maximum heart rate would be 200. This is the maximum times your heart should beat per minute when exercising. * Once you know your estimated maximum heart rate, you can calculate your desired heart rate target zone. This zone is the level at which your heart is being moderately conditioned but not overworked. Step Two: Determining your target zone. There are two levels considered, moderate(lower limit) and vigorous(upper limit) target zone. Moderate can be considered 50 to 70 percent of your max heart rate, and vigorous is considered 70 to 85 percent of your max heart rate. So, using our example numbers from above, your moderate(lower limit) target zone will be calculated by multiplying 200 x 0.5 for low end and 200 x 0.7 for high end. So after calculating this would show a moderate target zone of 100 - 140 beats per minute. A vigorous(upper limit) target zone would calculate as, 200 x 0.7 for low end and 200 x 0.85 for high end. So your target heart rate zone for vigorous exercise intensity would be 140 - 170 beats per minute. * To check beats per minute/heart rate, check your pulse at your wrist by placing two fingers between your bone and tendon over your radial artery which is located on the thumb side of your wrist. Step Three: Whether during or immediately following your workouts, check pulse for 15 seconds for quickest reading. After reading number of beats within 15 seconds, multiply this number by four. This will give you your current heart rate. For example, if you recorded 30 beats in 15 seconds, multiplied by four, this would calculate to 120 beats per minute. According to our example above, this would put you in the moderate intensity level zone.